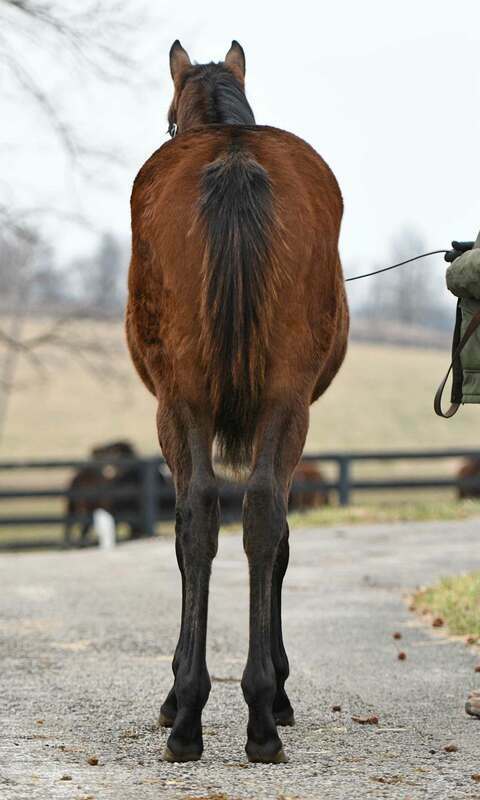 This racy filly is by Hill ‘n’ Dale’s hot young sire BAYERN. Racing for Kaleem Shah and Bob Baffert, BAYERNwas the top-ranked U.S.-based horse in the world in 2014 and multiple Eclipse Award finalist. As a three-year-old, BAYERNromped home by 7 ½ lengths in the Woody Stephens S., completing the seven furlongs in 1:20.75. He also dominated the G1 Haskell Invitational and G2 Pennsylvania Derby, both over nine furlongs, before ending his campaign with a dramatic victory in the $5 million G1 Breeder’s Cup Classic at a mile and a quarter in 1:59 4/5, posting a 113 Beyer. On the board in 10 of 15 starts, BAYERN retired with six wins and earnings of nearly $4.5 million. 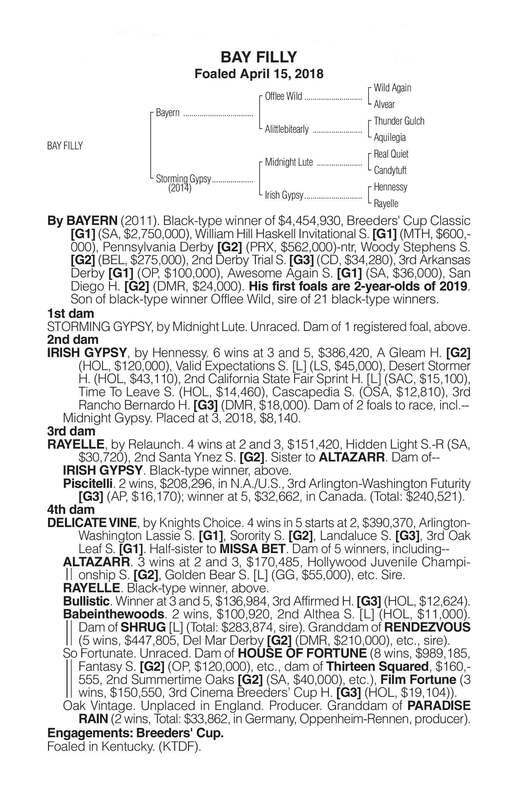 Royally bred, BAYERN’s third dam is the blue hen mareCOURTLY DEE, and is also from the family of group winner Bertolini and graded stakes winners Assateauge, Kindergarten Kid and Rainha da Bateria. 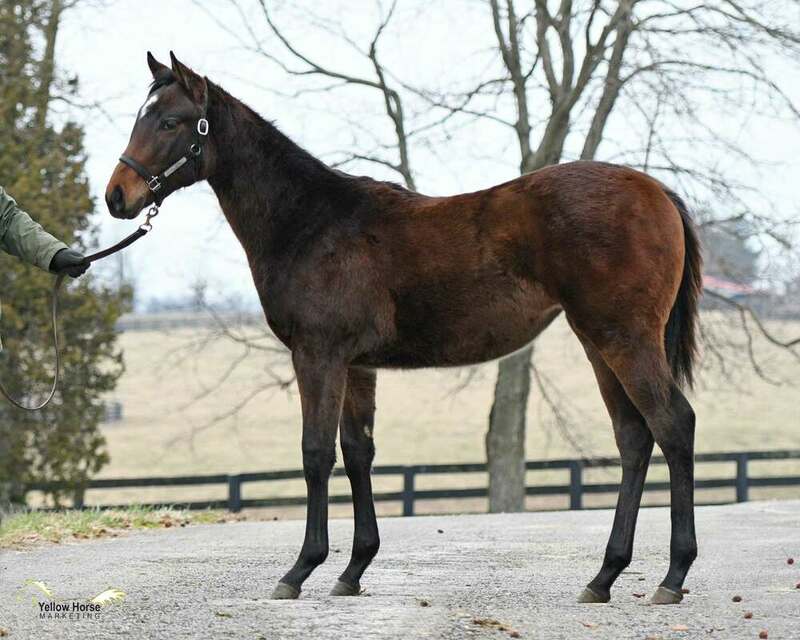 BAYERN progeny are now scoring at the sales: his first crop of weanlings sold for up to $220k, and last year yearlings sold for $435k, $300k, $285k, $260k, etc. as well as a $600k whopper at Saratoga! 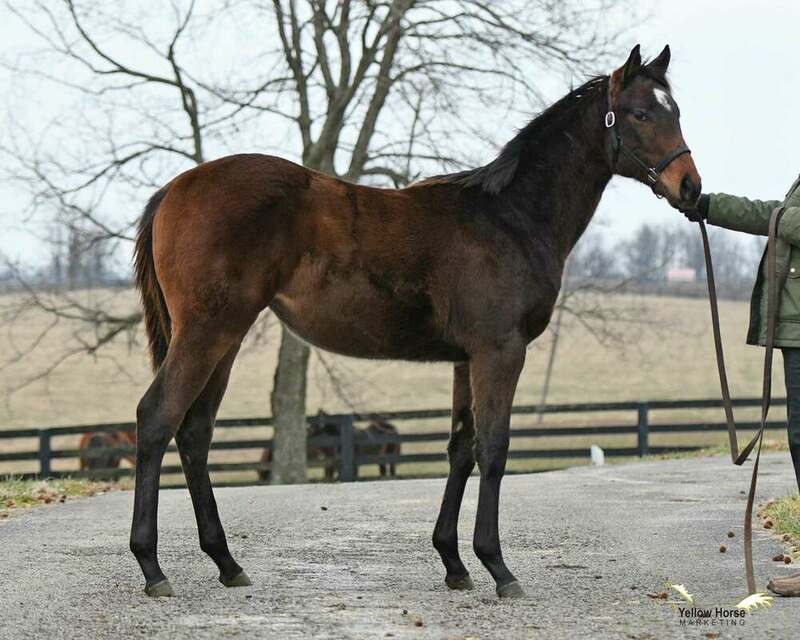 This filly is the very first foal out of a MIDNIGHT LUTE mare who is a daughter of G2-winner IRISH GYPSY(by HENNESSY).